Yes, that time of year is approaching once more. Have you started your back-to-school shopping yet? Well, at least your Sims can get a jump on things. 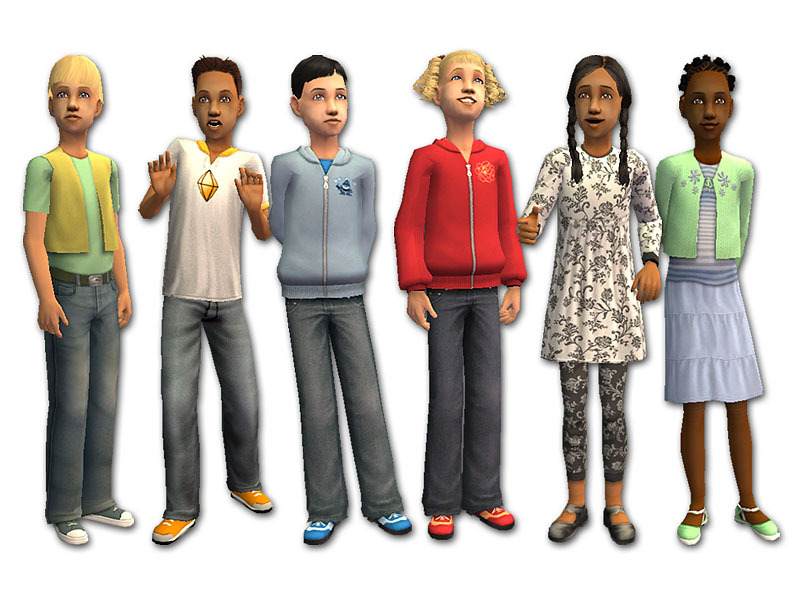 Here are five new meshes and plenty of colours from which to choose. 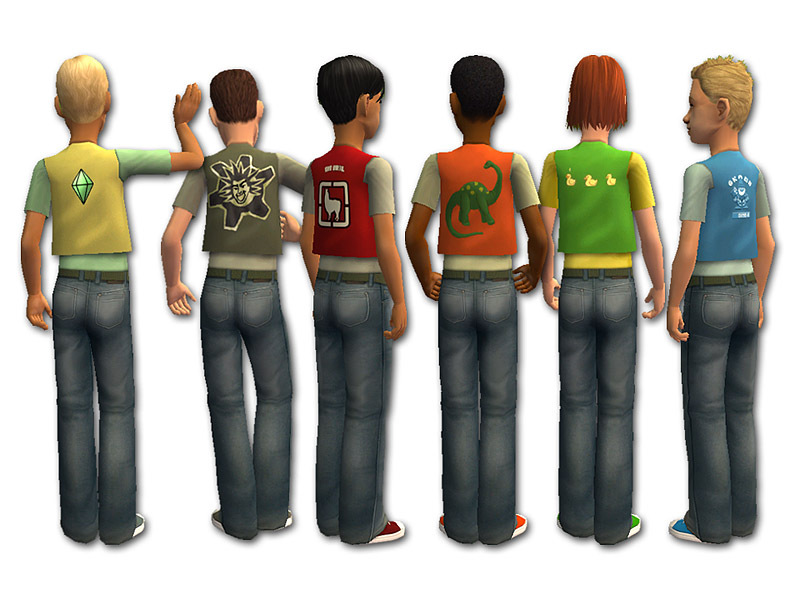 Your Sims may not want to go back to school, but maybe buying them a bunch of new clothes will soften the blow a little. 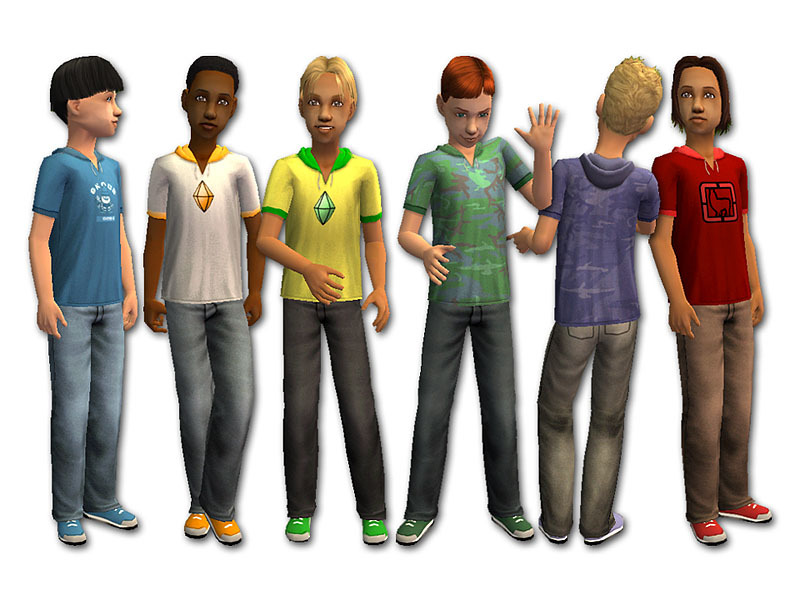 To start things off, we have an outfit for little Sim boys. It features basic jeans and a t-shirt, along with a vest. Each vest has a different graphic on the back, and it comes in six colours: yellow, khaki, red, orange, green, and blue. The silver belt buckle has a scorpion on it (swiped from big brother… don’t tell!). Each outfit comes with matching sneakers. The next offering is a short-sleeved hoodie. This is also for boys. It comes in six styles/colours: blue gnome, orange & white plumb-bob, green & yellow plumb-bob, green camouflage, blue camouflage, and red llama. These hoodies come with jeans and matching sneakers. One thing that was lacking in my game (with my configuration of EPs, anyway) was a good, all-purpose, long-sleeved hoodie for kids. So I made a whole bunch. There are six hoodie for boys. They are layered over a t-shirt and come in more muted tones than the girls’ hoodies. (I’ve set these ones so they’ll work for girls as well… just in case your tomboys find the girls’ hoodies a little too… well, girly.) The hoodies with the t-shirts come in dusty blue, orange, yellow, green, red, and light blue-grey. 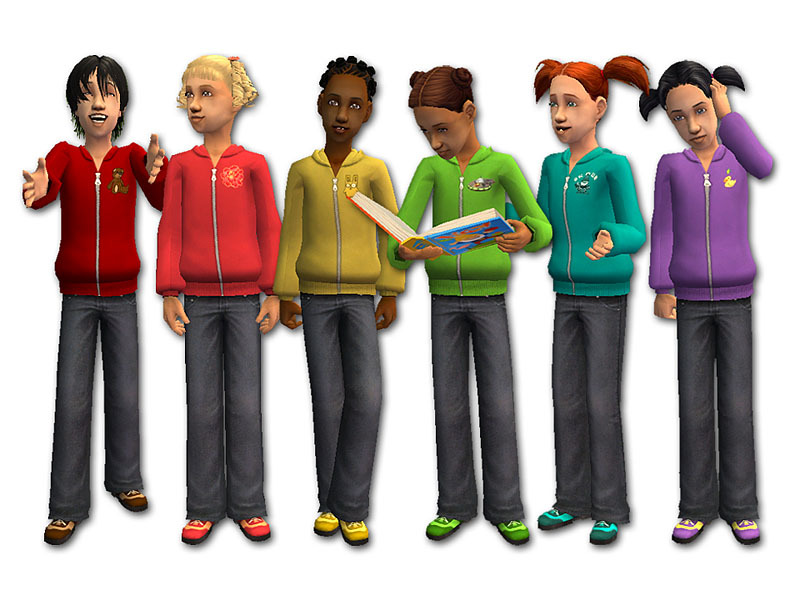 There are also six hoodies just for girls (they look like they might be layered over a tank top) that come in a rainbow of colours: red, orange-red, gold, green, turquoise, and purple. 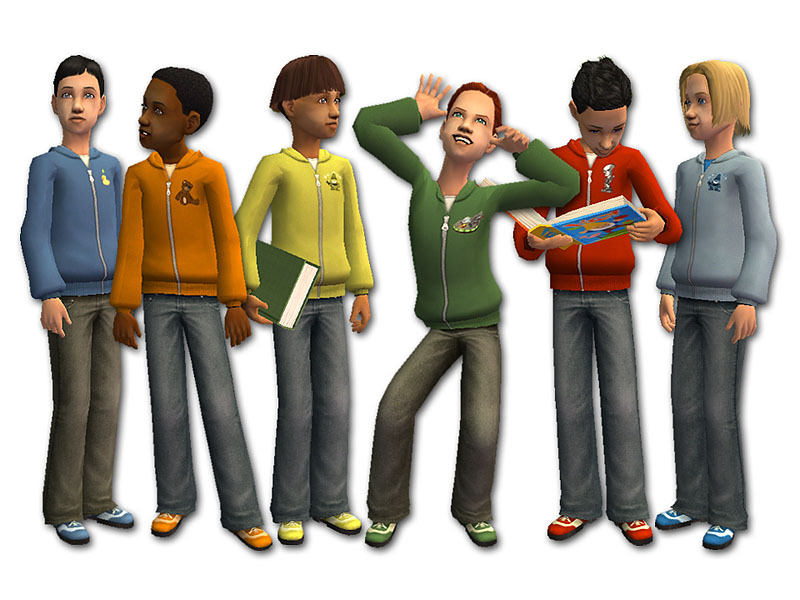 All the hoodies have a decal on the chest of a Maxis character. They come with jeans and matching shoes. 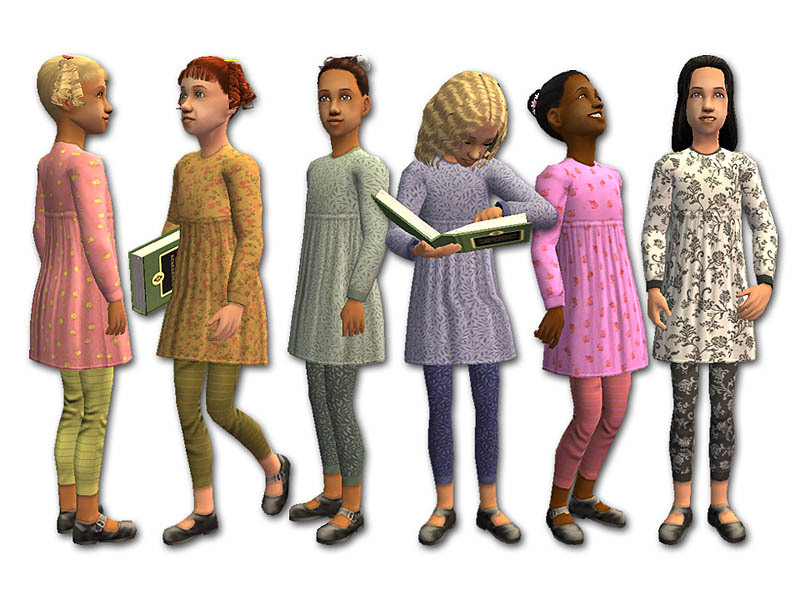 Next on the back-to-school shopping list are some simple pullover dresses for girls. All of the dresses come with coordinating leggings and there are six colours to choose from: pink with yellow flowers, gold floral, green leaves, blue leaves, fuchsia with pink flowers, and black-on-white floral. They all come with black Mary Jane shoes. These dresses would be perfect for cartwheels on the playground. 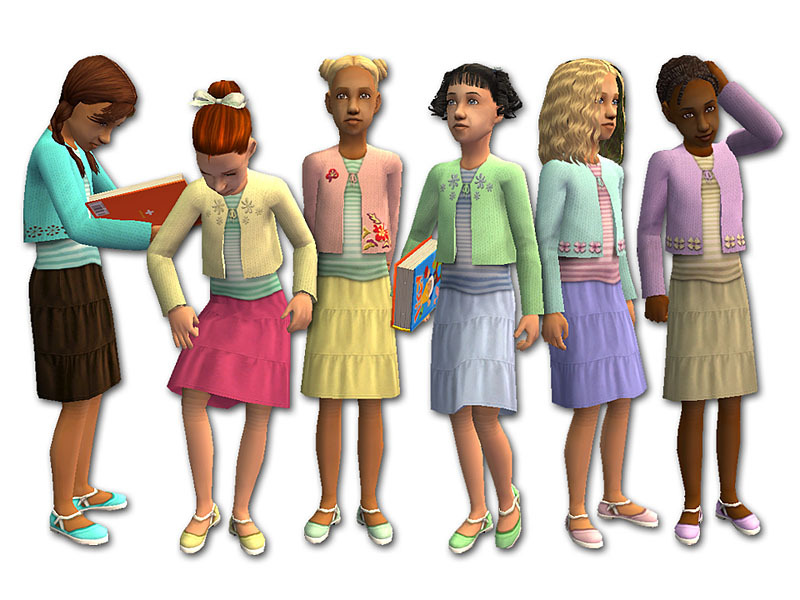 And last (but not least) we have a sweater and skirt set for girls. Each sweater features some kind of decoration (decal or embroidery) and coordinates with the striped shirt, skirt, and shoes. There are six colour combinations from which to choose: turquoise with chocolate brown; yellow, green, and dark pink; pink, green, and yellow; green and blue; aqua, pink, and periwinkle; and lilac and tan. All of these clothes require my custom meshes, which are included in their respective files. If you would like to make recolours, please link back to this thread for the proper mesh. Thank you to tiggerypum and HystericalParoxysm for their great meshing tutorials. Thanks also to wes_h, CatOfEvilGenius, and t2suggas (and anyone else I might have missed) for answering my meshing questions and helping me figure things out. I certainly couldn't have done it on my own! 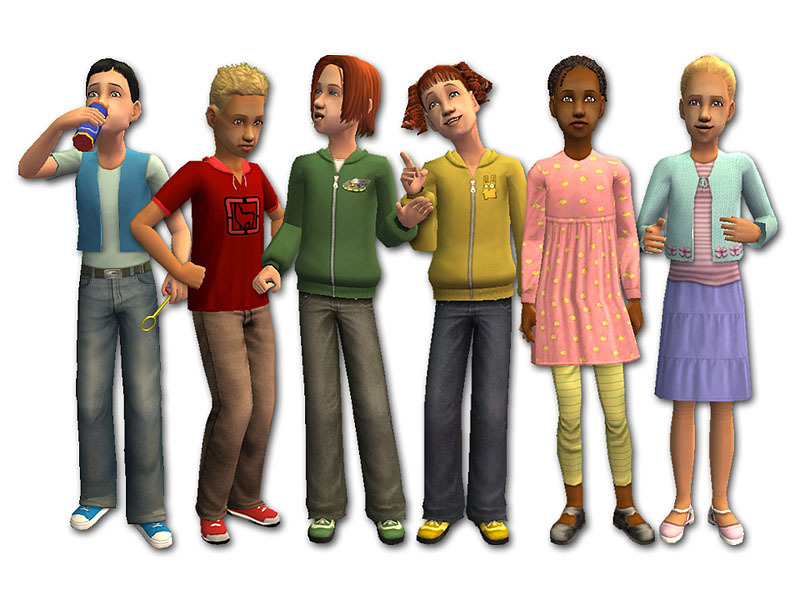 4950 people have said thanks to fakepeeps7 for this download.